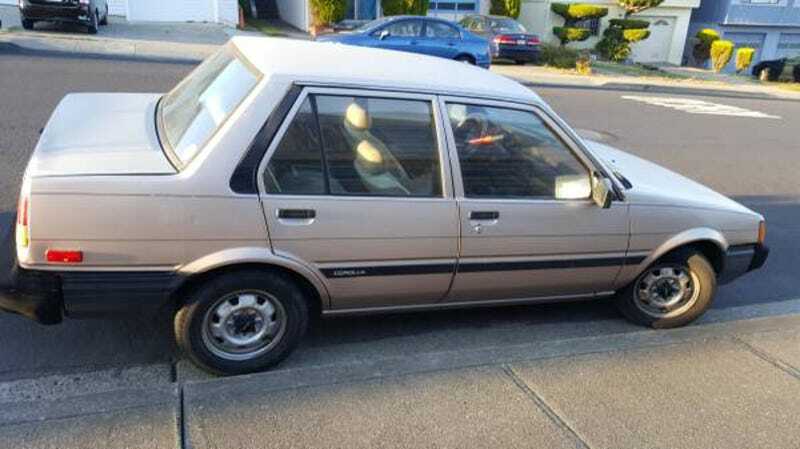 We all know it’s a ball to drive a slow car fast, and they don’t come much baller than today’s Nice Price or Crack Pipe Corolla with its diesel four and auto transmission. Maybe that factor, and its price, will have you rushing to vote it a winner. I feel like somewhat like Russell Crowe in Gladiator. I mean after yesterday’s manual-equipped and twin-turbo’d 2003 Mercury Marauder fell in a 66% Crack Pipe loss despite being priced like a freaking Versa Note, I wonder, are you not entertained? Yes, it did turn out to be a scam, but wasn’t it fun pretending it was real for a while there, wasn’t it? Oh well, never mind. Let’s move on because today we have a car that could be best described as the epitome of torpidity. You all recall Aesop’s parable about the tortoise and the hare, right? About how slow and steady wins the race? Well, I don’t know the veracity of that because to be honest, I don’t think there’s any races this 1984 Toyota Corolla Diesel is likely going to win. That’s not necessarily a bad thing however, because it obviously has other appealing attributes to make up for its expected slothfulness. First and foremost of those is its style, which one of the best to ever be worn by a Corolla, at least a FWD one. Look long and hard enough at the boxy shape and simple proportions and tell me if you don’t see traces of Alfa Romeo Giulietta Tipo 116 in its lines. Go ahead, I’ll wait. Of course, this being an ‘80s Toyota and not an ‘80s Alfa, it’s going to be reliable instead of a heart-wrenching and wallet-eating disaster should you choose to do more than merely look at it. The other plus here is that this is a diesel Corolla, one of a handful that were sold Stateside back in the day. That engine is a Toyota-designed 1,839cc SOHC four which is good for 57-bhp and 87 lb-ft of torque. Add to those meager numbers the fact that this one is saddled with a three-speed automatic and you can bet that 15-second or more zero to sixty times are this Corolla’s forte. Can I get a Yee-haw!? No? I didn’t think so. Slow as it may be, it’s going to be efficient when it comes to sipping that icky sticky stuff known as diesel. The car should get above 50 mpg on the highway (in the right lane, please) which is pretty impressive as long as you’re not racing to the hospital or anything. This one also won’t look too bad doing those mpgs. The champagne paint (fancy!) covers some war wounds and is obviously tired in a lot of places, like on the body. The black rubber baby buggy bumpers have also oxidized like they always do and likely will leave indelible marks on your khakis should you so much as brush up against them. The engine compartment looks okay, with the notable exception of the radiator, which appears to be coated with some sort of glue, or worse. Perhaps holding back a leak? We don’t know much about the interior because the seller didn’t bother to take any pictures of it—thanks dude. We can see in one of the pics that the front seats are reclined like Cheech and Chong have been rolling in it, but that’s as close as we’re allowed to get. The price is $2,950, or about what you’d spend annually on speeding tickets in yesterday’s Marauder if you bought that, which you couldn’t. What’s your take on this rare but slow reminder of Toyota’s past? DO you think it’s worth that $2,950 asking? Or, is this diesel a dud? H/T to ShibbyUTman for the hookup! At $5,450, Could You Feel the Fury of This 1987 Plymouth?